I have had a lot of questions about my thoughts on inflation and hyperinflation of late, especially in the new "Ask Mauldin" section on www.johnmauldin.com. Unfortunately, the answer is not short and simple. The good news is that my new book has an entire chapter on inflation and hyperinflation, and today, as I fly to La Jolla (more below), I give you that chapter as this week's letter. The letter will print a little long, as there are a lot of charts. Hopefully it will encourage you to want to read the rest of the book! Please note, my co-author (Jonathon Tepper) and I have different views on the subject, for different countries. In some, we consider high (or worse) inflation a serious prospect. In others the opposite is true. There is no one size fits all. And of course our best estimates today are based solely on the facts as we know them - if the facts change, so will our opinions. When we wrote this chapter late last year, it was not obvious that the Fed would purchase 100% of the US debt. We currently assume that will stop. If it does not, then the lessons of this chapter are more important than we would like them to be. Inflation and hyperinflation are choices made by humans. That means there is an element of uncertainty, when logic would dictate there should not be. And also, we start off the chapter a little tongue in cheek (we are NOT really recommending inflation as an answer to debt!). Endgame got up to #2 on Amazon yesterday (#1 non-fiction). Thanks to all you faithful readers who bought the book, whether there or at your local bookstores. Maybe this weekend, those of you who procrastinated will help us get to #1! And if you are going to buy some extra books for clients, family, or friends go ahead and do it now! No more procrastination! Go to www.Amazon.com and get clicking! I just bought the book myself (really!) on Kindle. I need it on my IPad for reference. It works great! And we are #1 on Kindle! OK, I will only be this aggressive for another month or so, then it's back into regular e-letter mode, but cut me some slack - books are a big deal for my generation. And I think this one adds some important insights to the national conversations that must be had around the world. Now, let's jump into the chapter on inflation. In the previous chapter, we looked at deflation. Now let's look at the opposite: inflation and even hyperinflation. Hyperinflation is an extreme case of inflation and a nightmare for anyone living it. We know that the world is drowning in too much debt, and it is unlikely that households and governments everywhere will be able to pay down that debt. Doing so in some cases is impossible, and in other cases it will condemn people to many hard years of labor to be debt-free. Inflation, by comparison, appears to be the easy way out for many policy makers. Companies and households typically deal with excessive debt by defaulting; countries overwhelmingly usually deal with excessive debt by inflating it away. While debt is fixed, prices and wages can go up, making the total debt burden smaller. People can't increase prices and wages through inflation, but governments can create inflation, and they've been pretty good at it over the years. Inflation, debt monetization, and currency debasement are not new. They have been used for the past few thousand years as means to get rid of debt. In fact, they work pretty well. The average person thinks that inflation comes from printing money. There is some truth to this, and indeed the most vivid images of hyperinflation are of printed German reichsmarks being burned for heat in the 1920s or Hungarian pengös being swept up in the streets in 1945. You don't even have to go that far back to see hyperinflation and how brilliantly it works at eliminating debt. Let's look at the example of Brazil, which is one of the world's most recent examples of hyperinflation. This happened within our lifetimes. In the late 1980s and 1990s, it very successfully got rid of most of its debt. Today, Brazil has very little debt, as it has all been inflated away. Its economy is booming, people trust the central bank, and the country is a success story. Much like the United States had high inflation in the 1970s and then got a diligent central banker like Paul Volcker, in Brazil a new government came in, beat inflation, produced strong real GDP growth, and set the stage for one of the greatest economic success stories of the past two decades. Indeed, the same could be said of other countries like Turkey that had hyperinflation, devaluation, and then found monetary and fiscal rectitude. In 1993, Brazilian inflation was roughly 2,000 percent. Only four years later, in 1997 it was 7 percent. Almost as if by magic, the debt disappeared. Imagine if the United States increased its money supply, which is currently $900 billion, by a factor of 10,000 times, as Brazil did between 1991 and 1996. We would have 9 quadrillion U.S. dollars on the Fed's balance sheet. That is a lot of zeros. It would also mean that our current debt of 13 trillion would be chump change. A critic of this strategy for getting rid of our debt could point out that no one would lend to us again if we did that. Hardly. Investors, sadly, have very short memories. Markets always forgive default and inflation. Just look at Brazil, Bolivia, and Russia today. Foreigners are delighted to invest in these countries. Endgame is not complicated under inflation and hyperinflation. Deflation is not inevitable. Money printing and monetization of government debt work when real growth fails. It has worked in countless emerging market economies (Zimbabwe, Ukraine, Tajikistan, Taiwan, Brazil, etc.). We could even use it in the United States to get rid of all our debts. It would take a few years, and then we could get a new central banker like Volcker to kill inflation. We could then be a real success story like Brazil. Honestly, recommending hyperinflation is tongue in cheek. But now even serious economists are recommending inflation as a solution. Given the powerful deflationary forces in the world, inflation will stay low in the near term. This gives some comfort to mainstream economists who think we can create inflation to solve the debt problem in the short run. The International Monetary Fund's top economist, Olivier Blanchard, has argued that central banks should target a higher inflation rate than they do at present to avoid the possibility of deflation. Economists like Paul Krugman, a Nobel Prize winner, and Blanchard argue that central banks should raise their inflation targets to as high as 4 percent. Paul McCulley argues that central banks should be "responsibly irresponsible." There are, however, problems with inflation as a policy tool. In this chapter, we'll examine inflation and hyperinflation, what they are, how they're different, and how hyperinflation ends. As a quick aside, that is why we expect the current attempts by the Fed at quantitative easing 2 to be probably ineffective: $600 billion is not all that much in the grand scheme of things. Now, if they start talking $6 trillion, that would get our attention. In the previous chapter, we discussed why the current crisis presents the real risk of deflation if monetary velocity falls and does not rise. However, there are many reasons to believe that we will not see deflation. The major mistake that deflationists now make is their focus on spare capacity. Central bankers and most economists assume that because of the huge deleveraging we're seeing, governments can print money and borrow like crazy without provoking inflation because of slack in productive capacity created by the recession. The severity of the recession means that they are wrong. During a normal downturn, production slows, but spare capacity isn't destroyed, and it is able to create extra supply when demand returns. A severe credit squeeze, though, does lasting structural damage, as the evaporation of bank lending destroys firms' longer-term ability to produce at given levels. People who think inflation isn't possible point to high unemployment in the United States, the United Kingdom, and Europe. But as we've shown earlier in this book, many of the unemployed in the developed world are unskilled or will be unemployed long enough that their skills will be totally rusty and, hence, they will be unemployable. The slack, in other word is imaginary. According to a major study by Athanasios Orphanides, now central banker in Cyprus, the "ex-post revisions of the output gap are of the same order of magnitude as the output gap itself, that these ex post revisions are highly persistent and that real-time estimates tend to be severely biased around business cycle turning points, when the cost of policy induced errors due to incorrect measurement is at its greatest. . . . The bulk of the problem is due to the pervasive unreliability of end-of-sample estimates of the trend in output." The English translation is: Economists and central bankers are very, very bad at estimating output gaps. No surprise there! Even Federal Reserve governors understand the problem. As Charles Plosser of the Philadelphia Federal Reserve has noted, "The data uncertainties are not just theoretical curiosities. They have caused actual problems when policy has been based on mis-measured gaps, resulting in unnecessary economic instability. A particularly poignant example is the Great Inflation of the 1970s in the U.S. [emphasis added]." I have written before that when you become a Federal Reserve Bank governor, you are taken into a back room and are given a DNA transplant that makes you viscerally and at all times opposed to deflation. Modern central bankers are much happier with inflation. They're pretty good at producing it, in fact. 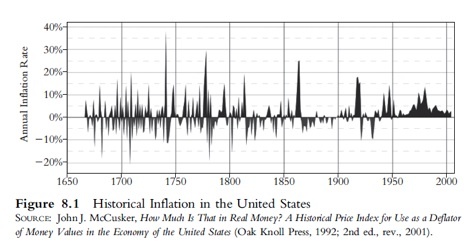 Figure 8.1 shows U.S. inflation historically, going back to the late 1600s. (How economic historians know what prices were centuries ago always amazes us, but that is the story for another fascinating book.) 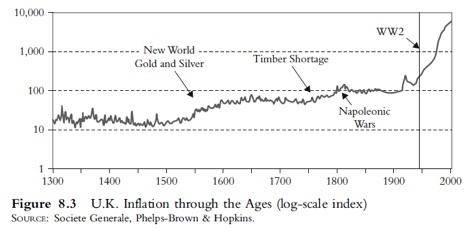 As you can see from Figure 8.1, when the United States and the rest of the world used a gold standard, periods of inflation alternated with periods of deflation. On average, the price level didn't go anywhere. One year's inflation was usually canceled out by the next year's deflation. But if you look to the right on the chart, you see that suddenly we don't get deflation anymore. After the Bretton Woods Agreement in 1948, when the world moved to a dollar standard only nominally backed by gold, and then after 1971, when the United States no longer made the dollar exchangeable for gold, something happened: We only got inflation. Figure 8.1 shows that inflation is the norm in a world of paper currencies. Central banks and governments have an inflationary bias. They can regulate monetary policy much more easily when interest rates are positive, so they prefer always to have some inflation in the system. In fact, there are very, very few examples of deflation after 1948 or 1971. In the previous chapter, we looked at the elements of deflation. Deflation can happen right after banking crises and property busts. It happened, for example, after the Japanese bubble burst and as the Japanese banks started going bust. It also happened after the housing bubble burst in Hong Kong in 1997, the banking bust in Ireland in 2008, and the Baltics after their housing bust in 2008. These examples are the only examples we know of deflation after 1971. Almost all of these cases happened because the countries had given up control of their monetary policy. Hong Kong, Ireland, and the Baltics did not control their own money supply. They operated pegs that fixed their exchange rate to the U.S. dollar or the euro (in Ireland's case, it was in fact already inside the euro). Japan is the one and only case of deflation in a country that is not pegged to another currency or in a currency union. As Reinhart and Rogoff have shown us, the typical pattern is for banking crises to lead to sovereign defaults and for sovereign defaults to lead to inflation. The simple explanation is that banking crises unleash powerful deflationary forces of deleveraging and falling monetary velocity. In this environment, people, corporations, and eventually governments are unable to pay their debts and default. Government defaults typically lead foreigners to sell the local currency, and you get a currency devaluation. A devaluation makes prices for imported goods more expensive and leads to inflation. At the same time, governments and central banks fight the downturn with more expansive monetary policies, which leads to higher inflation. The previous paragraph is a highly simplified (or if you're an economist, it is a highly stylized) version of what typically happens. But it is accurate. 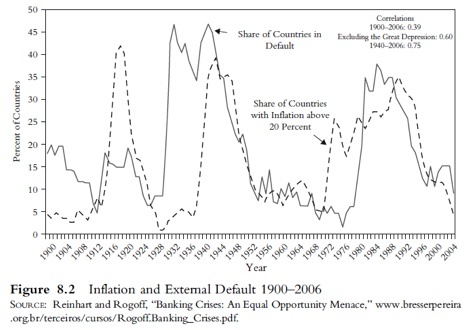 Figure 8.2, by Reinhart and Rogoff, captures very well how inflation typically follows external defaults, which typically follow banking crises. "What we need is a fiscal expansion (e.g. a temporary and large cut of sales taxes) that does not raise public debt in equal amount. This can be done with a 'helicopter drop' targeted at the Treasury. That is, a monetary gift from the Fed to the Treasury. "Critics may argue that this is simply voodoo accounting, as it is still the case that the consolidated balance sheet of the government, which includes the Fed, has incurred a liability. But this argument misses the point that the economy is in liquidity-trap range, and once this happens the system becomes willing to absorb unlimited amounts of money. In this context, by changing the composition of the liabilities of the consolidated public sector in the direction of money, the government gets a sort of 'free lunch.'" Of course, in Professor Caballero's defense, he argues that we should have a mechanism to drain this liquidity from the system, but realistically, would the Treasury or the Fed have the wisdom to do it? Inflation doesn't work as a policy response for many reasons. The reason inflation only makes things worse is probably best shown by looking at extreme examples, where the ravages of inflation are clearest and most evident. We will look at hyperinflations, which is a lot of fun for the reader, but not much fun if you've lived through hyperinflation. Just as Reinhart and Rogoff wrote the book on banking and debt crises, there is one book that is the bible on hyperinflations. Professor Peter Bernholz, from the University of Basel, has written Monetary Regimes and Inflation, which provides an overview of every inflationary episode that has ever happened, and he explains the origins and characteristics of hyperinflation. It is well worth your time if you are interested in the mechanics of hyperinflation. The only hyperinflation prior to the twentieth century was during the French Revolution, when the French monetary regime, too, was based on the paper money standard. We don't have very long-term inflation data for most countries, but as you can see in the case of the United Kingdom, where we have historical data, inflation was relatively stable for about 600 years. It was only after the United Kingdom moved toward paper money that inflation has really taken off. Unfortunately, this is true of every country with a paper currency (see Figure 8.3). 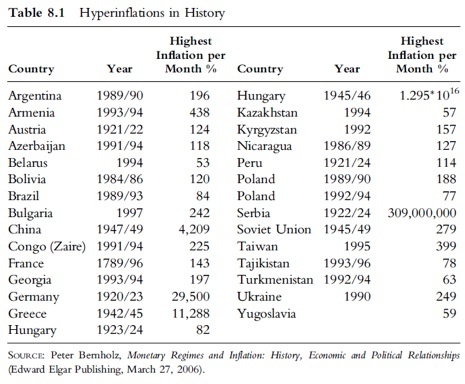 Interestingly, after countries abandoned the gold standard, there are more cases of hyperinflation than deflation. Figure 8.3 shows inflation, but we need to distinguish between inflation and hyperinflation. Many countries have high inflation, but hyperinflation is a very special case in which money grows greater than 50 percent from one month to the next. When money starts growing that quickly, the numbers become truly astronomical. 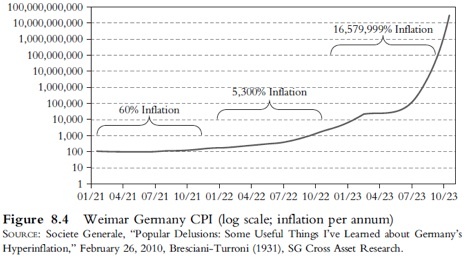 To give you a sense of just how crazy inflation can get once it gets going, Figure 8.4 shows inflation in Weimar Germany. You can see that toward the end of 1923, inflation was growing at 16 million percent per year. What kinds of prices does 16 million percent inflation give you? The highest-value banknote issued by the Weimar government's Reichsbank had a face value of 100 trillion marks (100,000,000,000,000; 100 billion on the log scale).6 At the height of the inflation, one U.S. dollar was worth 4 trillion German marks. One of the firms printing these notes submitted an invoice for the work to the Reichsbank for 32,776,899,763,734,490,417.05 (3.28 x 1019, or 33 quintillion) marks. *Metallic standards like gold or silver show no or a much smaller inflationary tendency than discretionary paper money standards. *Paper money standards with central banks independent of political authorities are less inflation-based than those with dependent central banks. *Currencies based on discretionary paper standards and bound by a regime of a fixed exchange rate to currencies, which either enjoy a metallic standard or, with a discretionary paper money standard, an independent central bank, show also a smaller tendency toward inflation, whether their central banks are independent or not. Bernholz examined 12 of the 29 hyperinflationary episodes where significant data exist. Every hyperinflation looked the same. "Hyperinflations are always caused by public budget deficits which are largely financed by money creation." But even more interestingly, Bernholz identified the level at which hyperinflations can start. He concluded that "the figures demonstrate clearly that deficits amounting to 40 percent or more of expenditures cannot be maintained. They lead to high inflation and hyperinflations. . . ." Interestingly, even lower levels of government deficits can cause inflation. 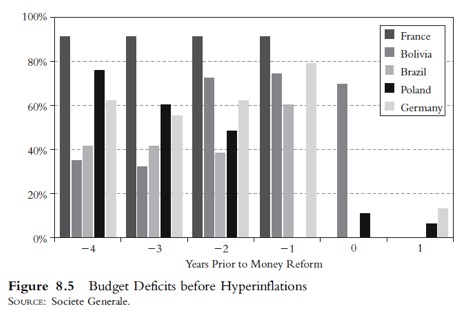 For example, 20 percent deficits were behind all but four cases of hyperinflation. Stay with us here, because this is an important point. Most analysts quote government deficits as a percentage of GDP. They'll say, "The United States has a government deficit of 10 percent of GDP." While this measure makes some sense, it doesn't tell you how big the deficit is relative to expenditures. The deficit may be 10 percent of the size of the U.S. economy; currently the U.S. deficit is over 30 percent of all government spending. That is a big difference. 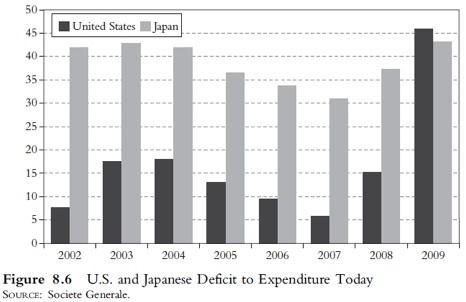 Figure 8.5 shows the level of deficits relative to expenditures before hyperinflationary periods. Interestingly, currently Japan and the United States are not far from levels that have preceded hyperinflations. The big difference between Japan or the United States and countries that have experienced hyperinflations is that the central banks are not monetizing most of the deficit. If they were to do that, then we would be one step away from paying quadrillions of dollars for a stamp or a sandwich (see Figure 8.6). It is extremely important to note Bernholz's conclusion. Hyperinflations are not caused by aggressive central banks. They are caused by irresponsible and profligate legislatures that spend far beyond their means and by accommodative central banks that lend a helping hand to governments. What are the implications for the present day? Fiscal liabilities are the real threat that will lead to higher inflation, if central banks continue to monetize government liabilities. In the case of a monetization, governments with independently authorized central banks disavow the overly convenient slippery slope option of paying their bills by printing new currency. A government must pay down its liabilities with currency already in circulation or else finance deficits by issuing new bonds and selling them to the public or to their central bank to acquire the necessary money. For the bonds to end up in the central bank, it must conduct an open market purchase. This action increases the monetary base through the money creation process. This process of financing government spending is called monetizing the debt. Monetizing debt is thus a two-step process where the government issues debt to finance its spending and the central bank purchases the debt from the public. The public is left with an increased supply of base money. "The unfortunate conclusion is that QE2 will be of limited success in sustaining high growth and job creation in the US, and will complicate life for many other countries. With domestic outcomes again falling short of policy expectations, it is just a matter of time until the Fed will be expected to do even more. And this means Wednesday's QE2 announcement is unlikely to be the end of unusual Fed policy activism." Do we think the Fed will abandon its responsibility to control inflation and resort to total monetization of U.S. debt? No. But in the attempt to get mild inflation, it is possible the controlled fire they hope to kindle could get out of control, forcing them to act to take back the excess reserves and bring about a recession, as did Volcker. Let's hope it does not come to that. If inflation is the cure for too much debt, as we suggested earlier in our tongue-in-cheek example of Brazil, why is it that high inflation and eventually hyperinflation made things worse? Governments have to spend money all year round, but typically they collect tax revenues at the end of the year. So the value of the government's revenue in real terms is constantly diminished until the money is spent. Indeed, plugging a hole with inflation merely makes the hole bigger. Digging yourself deeper in an inflationary situation is what economists call the Tanzi effect, after the economist who discovered it. Hyperinflations are all very similar. At first, bad money drives out the good. Under the Greeks and Romans, when gold coins were debased, few people were dumb enough to want to exchange their old coins that had high gold content for newer ones that had low gold content, so older good coins disappeared as people hid them. This is called Gresham's law: Bad money drives out good money. In modern hyperinflations where gold coins don't exist, people begin to barter and exchange goods and services to avoid having to use devalued paper. Then, if they can get their hands on a foreign currency that is perceived to be hard and unlikely to lose its value, like dollars or deutschmarks, they will start to use the foreign currency. At first, they'll use the foreign currency as a unit of account to settle wages and price negotiations, then as a means of exchange, and finally as a store of value. Once enough people use the hard currency, Gresham's law reverses itself and hyperinflations come full circle. The good foreign money drives out the bad, and the inflating currency becomes totally worthless. This is called Their's law. This happened in Argentina. If you are buying a home, you literally come to the closing with large bags of physical U.S. dollars. One side counts the cash while the other checks the paperwork. The consequences to this pattern are dreadful. Hyperinflation completely destroys the purchasing power of private and public savings. No one wants to hold paper money, so it leads to excessive consumption and the hoarding of real assets. Investors face uncertainty and refuse to invest, unemployment skyrockets, and savings flee the country. The best-performing stock market in 2008 was Zimbabwe, which offered people a way to hedge their currency risks, even as their economy plummeted. It's tempting to think that highly indebted countries can inflate their way out of their fiscal problems. Inflation would erode the real value of debt. Debts are fixed, while workers, companies, and governments could earn higher income as wages and prices could be indexed to inflation. The main drawback of high inflation or hyperinflation is that most people become poorer through reduced real income. 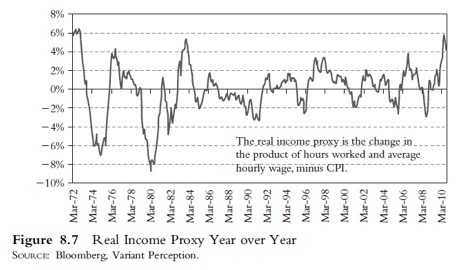 If we look at the real incomes, we can see that periods of high inflation, for example in the late seventies and in the last few years, have led to negative real wages. On the other hand, periods of disinflation and deflation have led to periods of positive real wage growth. Simply put, prices go up faster than wages, so the things you need to buy tend to go up faster in price than your salary (see Figure 8.7). There are three main problems with trying to use inflation to get rid of the value of real debt. Investors would recognize even a stealth inflation policy and quickly push up yields. Many governments around the world have tied pensions and salaries to inflation measures, so increases in government spending would rise with inflation. Nearly half of federal outlays are linked to inflation, so higher inflation means higher deficits. Social Security, which represents about 25 percent of federal spending outlays, is officially indexed, and Medicare and Medicaid are unofficially indexed. Indeed, over the period 2009 to 2020, the Congressional Budget Office (CBO) estimates that these three programs will account for 72 percent of the growth in total federal outlays and about the same share of the growth in debt. If anything, CBO's assumptions may be conservative, as they are required under current law to assume a sharp cutback in physician reimbursement payments under the Medicare program. Those cuts have been delayed every year since 2003. Any increase in inflation will erode the value of existing debt, but it will make deficits much larger going forward and even possibly increase the real burden of debt as a percentage of GDP. The CBO estimates that if inflation is 1 percentage point higher over the next decade than the rate CBO has projected, budget deficits during those years would be roughly $700 billion larger. "'It will be demonstrated by looking at 12 hyperinflations that they have all been caused by the financing of huge budget deficits through money creation" [emphasis added]. This expresses the fact that only credit extended directly or indirectly by the monetary authorities to the government leads to the creation of money, that is, an increase of the monetary base. This is not true for borrowings taken up in the capital markets if they are not resold to the Fed. Looking from this perspective at the U.S. deficit, by far not all of the credits borrowed by the government were financed by the Fed. 'According to preliminary and rough estimates, not 40 percent but "only" about 13 percent of U.S. expenditures are presently financed this way. Moreover, in discussing this problem it has to be taken into account that about two-thirds of dollar bills are estimated to circulate abroad. This -- together with the fact that incredibly huge holdings of dollar assets are owned especially by the central banks of China, India, and the Gulf States -- may pose other and later dangers. But these dangers will be, except for a return of the dollar bills and a purchase of foreign-owned dollar assets by the Fed, of a different nature. Inflation may rise more or less strongly during the next years, but there is presently no danger of a hyperinflation in the United States.'" Bernholz is likely being far too generous to the Fed and Congress. He is not counting more than $700 billion worth of mortgage bonds by Fannie and Freddie that the Fed bought with money it printed. Arguably, if other central banks had not been dumping their mortgage-backed securities, the Fed would have monetized 100 percent of the U.S. deficit through Treasury purchases. Interestingly, the only country in the world that currently fits the bill for hyperinflation is the United Kingdom, where 100 percent of the budget deficit was monetized by the central bank. Unsurprisingly, ever since, inflation in the United Kingdom has consistently overshot the Bank of England's own forecasts. Apparently, they don't see a connection. While it is unlikely that the United States, Japan, or any other country will soon enter hyperinflation, the situation could change in the future if any of the central banks were to lose their independence or continue to coordinate their actions with their treasuries. Central banks have lost a lot of independence through quantitative easing. They may say they are keeping an arm's length from the legislature and the Treasury, but few are fooled. Central banks in the United Kingdom, Europe, and the United States are now effectively working alongside the Treasury to pump money into the economy, so far with limited results due to the massive deleveraging in the private sector. They may continue to try this on a greater scale, and the larger the scale, the greater the need for coordination and the less the independence. If we go into a downturn, we hope central banks will be wise enough not to monetize government debt in any fiscal crisis. Sadly, they probably will. The Federal Reserve has made spectacular mistakes over the past few decades. Under Alan Greenspan, the Fed's only solution to any problem was to provide more liquidity. To a man who only has a hammer, everything looks like a nail. Under Bernanke, the Federal Reserve effectively monetized government debt and monetized mortgage bonds held by quasi-government entities like Fannie Mae and Freddie Mac. If we go into another downturn, will the Fed use its hammer again and provide more liquidity by monetizing even greater quantities of government liabilities? We hope not. Debt deflation is a terrible thing, but hyperinflation is even worse. We must remain vigilant that central banks maintain their independence. What are we predicting for the US and your country? That's all in the following chapters. Go to www.amazon.com to get your own personal guidebook to the coming few years. Next Saturday I am off to Europe. We are working on a book "launch" party with my co-author, Jonathan Tepper, in London on Monday Happy Hour in the City area. Drop me a note for details. And I will be on CNBC Squawkbox as guest host in London (I love that gig; lots of fun, smart anchors!). Then Malta, Milan (a public speech), and Zurich and home. I am on my way to La Jolla for my good friend Jon Sundt's birthday party tonight (his 50th!) which will be a hoot. Keb' Mo', for you blues guys, will be the entertainment (lots of his stuff on YouTube). I love it. Jon has had a very impressive run for only 50 years, and I want to honor his life. Not just his work life, but his efforts in drug education for our kids, and as a great father, are an inspiration. To many more years of partnership, my friend! It looks like I will be going to Korea in mid-May. I look forward to going for the first time to the country from which I have two adopted children. My twin daughters are a true joy in my life. And I will be in NYC April 4-6 (that is the plan for now!) doing media for the book and some research. 12 Mar 11, 15:40 Other Hyperinflations? What do you think of these hyperinflation ?